Happy American Archives Month! Celebrate this October by visiting the archives and learning about some local history! The UB Special Collections & Archives is excited to announce that the David H. Hugel Papers are newly processed and open for research! One of the best parts of being an archivist is working with wonderful donors who want to share their legacy with future researchers. David H. Hugel is one donor who has given his collections to the archives in hopes of contributing to history. Recently, new accessions (that’s archivist-speak for new additions) to this collection arrived in the archive and I had the chance to process (organize and make accessible in an online finding aid) the entire collection featuring a UB alum! Artificial flowers Used in Maryland Float in 1969 Inaugural Parade Honoring President Richard Nixon & Vice President Spiro Agnew, 1969; David H. Hugel Papers; series 1, box 1; University of Baltimore Special Collections and Archives. David H. Hugel (b. 1942 -) earned his Juris Doctor degree in 1973 and Master of Science in Criminal Justice in 1977 from the University of Baltimore. A Vietnam War veteran whose photographs of the war have been featured in museum exhibitions and publications, Hugel is a nationally recognized public and highway safety authority who has worked in numerous prominent positions such as the State’s Attorney’s Coordinator in the Office of the Maryland Attorney General, as the Administrator of the Maryland Motor Vehicle Administration, and most recently as the Deputy Administrator of the Federal Motor Carrier Safety Administration in the US Department of Transportation among other positions. Hugel’s early career involved working in public relations and television in Baltimore during the 1960s. His collection even includes some film from that time period. He also worked on political campaigns such as the Maryland Nixon-Agnew campaign, Congressman Larry Hogan’s 1974 campaign for the Maryland Republican gubernatorial nomination, and Stanley Blair’s 1970 gubernatorial campaign. Mr. Hugel played an active role in the 1968 Nixon-Agnew presidential campaign and was appointed by the Vice President Elect to serve as publicity chairman of the Maryland Inaugural Activities Committee. In this role, he managed the public relations details of Maryland’s participation in the 1969 Presidential Inauguration and he oversaw the planning of a Gala ball honoring the new Vice President held in Baltimore January 24, 1969. One very interesting find in this collection were the artificial flowers from a 1969 Maryland Float in the Inaugural Parade for Nixon and Agnew. 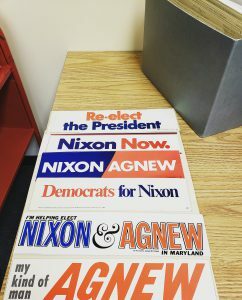 Bumper Stickers: Agnew for Governor and Nixon-Agnew, 1966-1968; David H. Hugel Papers; series 1, box 1, University of Baltimore Special Collections and Archives. Hugel’s career has included working with public relations, political campaigns, highway safety transportation regulatory and legal issues, and freelance writing! In 2009 he retired after serving as a senior executive with the USDOT, and Hugel now regularly contributes to veterans and military focused publications. His photographs of the Vietnam War are also on display in the National Museum of the Marine Corps and have been published in several publications. While working with this collection, one thing that stood out was that the collection shows the many ways Hugel expanded upon his interests throughout his life and work. Hugel began his career in Baltimore and like many other University of Baltimore alumni, he found ways to contribute to the community and the region. Materials in the collection include items reflecting Hugel’s legal career; campaign materials for Republican candidates for state and national office, including Spiro Agnew, Richard Nixon, C. Stanley Blair, Thomas Anderson, and Herbert J. Miller, Jr.; and numerous copies of publications including articles authored by Hugel. Personal papers can teach us about the life and history of a particular person, but they also offer a unique opportunity for researchers to learn about many other aspects of history depending on what the creator of the collection collected over the years. Researchers interested in political history and past campaigns in Maryland, veterans and military history, and the history of highway safety and transportation legal issues will find this archival collection very interesting. If you would like to view and/or use the David H. Hugel Papers for yourself, please contact the Special Collections & Archives to set up an appointment! The David H. Hugel Papers are available for research! This entry was posted in accessions, accruals, archival research, archives, ArchivesSpace, baltimore, collections, community archives, community history, Special Collections and tagged American Archives Month, found in the archive by Laura Bell. Bookmark the permalink.